OK, I'm no Dr Seuss. Do I run the current application windowed or full-screen? This may not seem to require much thought. Whatever works, right? But is our decison working for our productivity, or against it? Lots of people blow up every application to full-screen and switch back and forth in a mad fit of mouse-clicking. Others keep all their apps on screen and fling them around like Tom Cruise in Minority Report. I have some opinions on when one or the other is more effective. I don't have science to back up all of these opinions. If you do (or evidence against), send me an email! These are pretty good ideas for lots of things, not just computer use. The biggest leap in productivity and joy for most people is when they move from one screen to two. Even fifteen years ago, Albert Balcells, the vice-president of CoActive Marketing Group's development department, told me, "The studies show that you'll make back the few hundred dollars you spend on a second screen within three weeks." What I commonly hear is, "Wow, now I can have one document open on one screen while I'm working on another!" This is a perfect use case. For example, if I'm researching for a blog post, I'll take notes on one screen while zooming around the web browser in the other. When I'm programming, I have to look up lots of stuff. 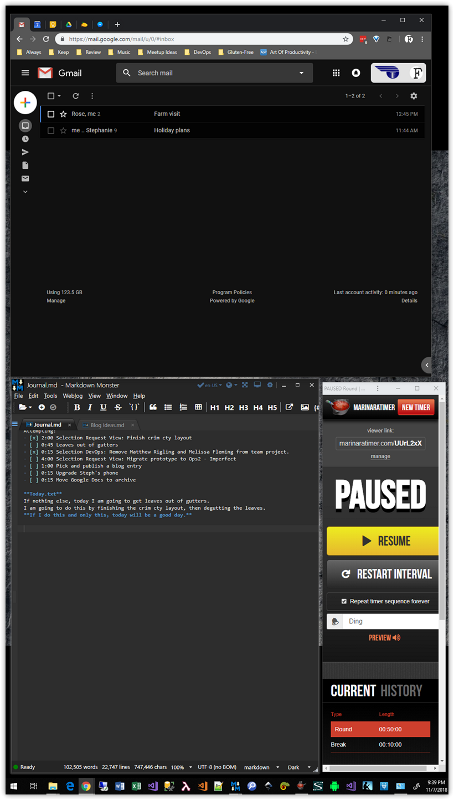 Keeping the editor in front of me, and a browser full of tabs on a separate screen, triples my productivity. What about three screens?, you ask. I use three screens, and find it effective. I'll bet many people do the same thing as I do. One screen is dedicated to just a few apps that are always open and visible. For me it's email, journal and time-boxing timer. I have that monitor oriented in portrait mode. So, yeah, if you can afford it, do it. But don't increase your distractions! Apply the same rules to three monitors as you do to one! Avoid closing windows when you're temporarily done with them. Learn and anticipate when you'll be going back and forth between applications. If you don't need an application on the screen, minimize it. I've seen lots of users waste lots of time opening Word, opening a document, doing one thing, closing the document, opening another window, then a minute later closing that window and opening Word again. It's exhausting. Even with multiple large screens, layering windows on top of one another is inevitable. Do this effectively if you're switching between them. You should always be able to see enough of a window to identify it and open it without completely obscuring some other window. Of course, if you have bad eyes, you'll be going full screen more often. But you can still apply the principles. We think we can do creative or cognitively intensive work while listening to music, reading and commenting on social media, checking email, and playing with our phones. We can't. Humans don't multi-task (really, they don't), and are poor at task-switching. You're not an exception. You think you are. I know you do. But you're not. The science on multi-tasking and task-switching is consistent. You shouldn't use the phone in the car either, not even hands-free, because every study for the last twenty-five years shows it doesn't matter, it's just as dangerous as drinking and driving. Stop it. Your life's more important, and so is mine. When you're writing your grant proposal, or need to get into the programming zone, or focusing on that merchandising layout, go full-screen, minimize any other window that you can, and turn off your distractions. There is science to back this up, so you don't have to trust me, you can look it up. But save yourself some time and just try it. Going full-screen not only helps focus on the job at hand, but is also valuable because of the number of tools, toolbars, menus, etc. on high-end applications. For example, if you do photo editing, programming, vector drawing, there could be a hundred or more things to click in front of you. Multiple windows aren't the only distraction. You might want to reduce what the apps show, too (I touch on this later). Most of the time, I work in mixed mode. I have my important windows open and arranged so I can reduce task-switching, and I go full-screen when the need arises. In movies, it's really cool to see all these screens with stuff constantly moving on them. But in heads-down mode, it's just another eye-catcher. Just as you can't help watching the TV when you're on a date at a bar, anything else flickering or moving nearby only adds to your distraction. Either minimize it or, in the case of a web browser, switch to a tab that's static. Don't tell yourself you can watch The Lost Room while coding a banking data integration. You won't fully enjoy the former, and will screw up the latter. There's a class of applications called "zenware." The idea is that they focus on providing a distraction-free experience. Even if you don't stick with it, try out a few. This may really influence your experience of your everyday apps, and you might find yourself paring down what's on the screen. Applications' default layouts are often not the most efficient. They're there to show you the application's capabilities, not improve your work flow. Only keep the tools/frames open that you use frequently. Reduce clutter, but also make it easy to open what you need. This is a sensitive subject, so definitely take it or leave it. Computer desktop wallpaper is one of the few things users can easily personalize. Except in rare situations, I think businesses should let users set whatever wallpaper they want as long as it's work-appropriate. What that means can be vague, but if there's a question there's an opportunity for better communication. Regardless, I prefer wallpapers that are interesting but also truly fade into the background. My favorites are black-and-white photos that aren't very busy. Try thinking of your computer wallpaper as a canvas, not a photo album. Do you really want to find out what difference it makes? Switch your wallpaper to plain black, dark grey, or whatever color pleases you (but I wouldn't go super bright). Try that for a week. Then switch back to your other wallpaper. Which is less stressful? Here's a wallpaper I like. 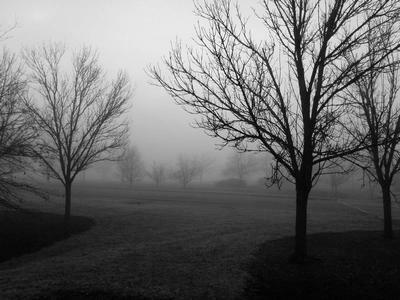 It's a photo I took of Winton Woods in Cincinnati, Ohio. I hate them. 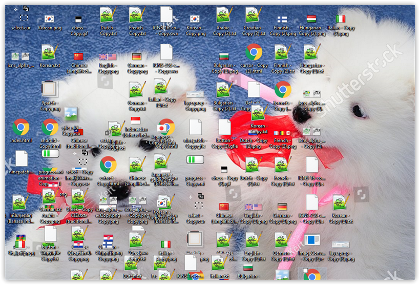 I especially hate when users have hundreds on their desktop plus a picture of a puppies playing with ribbons. Unfortunately, the reason so many users use the desktop for storing files and folders is because they've never been taught how to use the Windows Explorer as originally intended. And I don't blame them, because for years Microsoft and Apple have tried to make file management "better" by hiding something everyone can understand if given half a chance. The computer file system is based on physical file cabinets, which have been around for centuries. The big problem with icons on the desktop is that, in order to work with them, you have to minimize open applications. That's a huge time sink. Don't open applications using desktop shortcuts. Pin them to the task bar, instead, because it's always available. Then delete those shortcuts. On Windows 7 and 10 you can right-click a taskbar app icon to see the most recent files. Organize your files in the Documents folder, then keep the Windows Explorer window open or minimized. If you must keep icons on the desktop, limit yourself to only the most important you're working on right now, no more than a dozen, and put them all on the left or right side. Most people seem to prefer the left. This lets you resize windows so that the icons are still in view. Keep other distractions to an absolute minimum. Do you really need to be notified whenever an email arrives? Does your job require following messaging feeds while trying to focus on the task at hand? In most cases, the answer is "no." Don't let applications interrupt you when they want to. They are not the boss of you. You decide when to check email. As I discovered when writing this post, the real issue isn't whether to run apps full screen or not. It's why, and that boils down to distractions. Maybe this will help in some way. I hope it'll inspire you to examine how you're working and try some experiments.